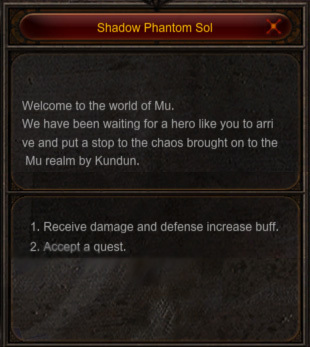 Shadow Phantom Soldier <+> [MU Online Fanz] <+> Official 3rd-party [MU Online] Fan Site & Game Guide! Shadow Phantom Soldiers will aid you on your way to becoming a great warrior. These soldiers will offer a large variety of quests, as they always need help protecting the great continent of MU. This NPC can be found in Lorencia, Noria, Elveland, and Devias. Check the Shadow Phantom Soldiers Quest Guide for more info about the quests these soldiers offer.